The front flower bed is overgrown and starting to head downhill. 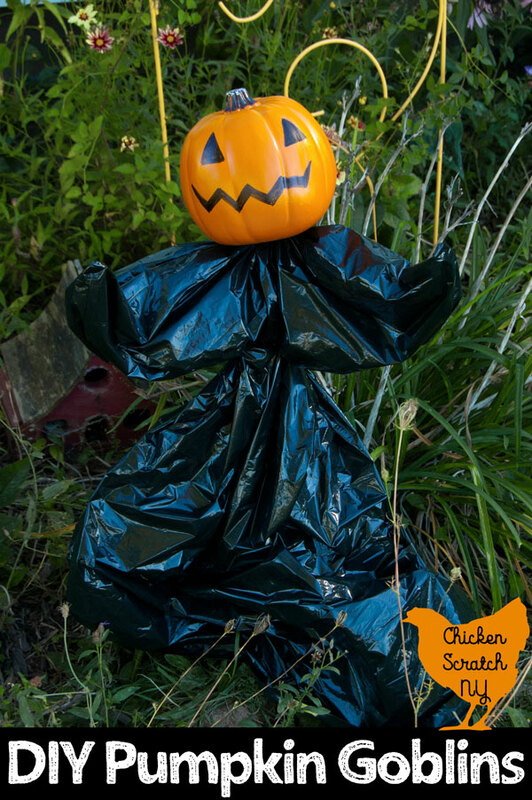 My latest Halloween creations, the Pumpkin Goblins are in need of a home so it’s perfect timing. They look perfectly at home among the declining cone flowers and creeping weeds. 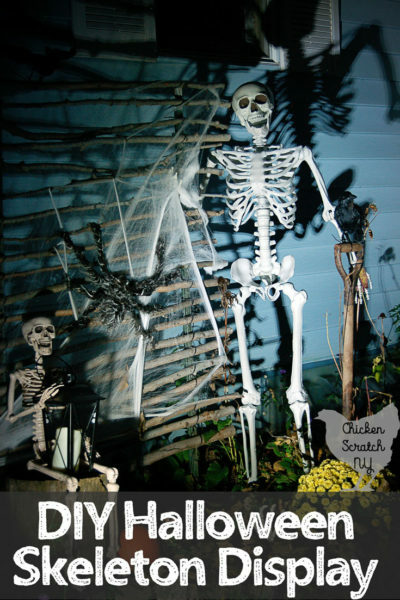 I’ve already set up a few skeletons and one giant clothesline spider web to set the mood and they’re fitting right in. This is another one of those projects that I came up with on the fly. I’ve seen similar stuff in the store but always cheap quality and still more money than I ever want to pay. A quick Michael’s trip ended up with small fake pumpkins in need of a home. They were on sale for $4, further solidifying my belief that you never pay full price for anything at Michael’s. I needed to make another stop at Lowe’s for a few random bits and bobs and I grabbed 4 ft metal fence posts. Usually you put 8-12 inches into the ground so your goblins will be about 3 feet tall. The other supplies are all things I had hanging around the house. The wire is left over from an old fence that was here when I moved in. A wire hanger doubled up should work, you’re only holding up a garbage bag after all. 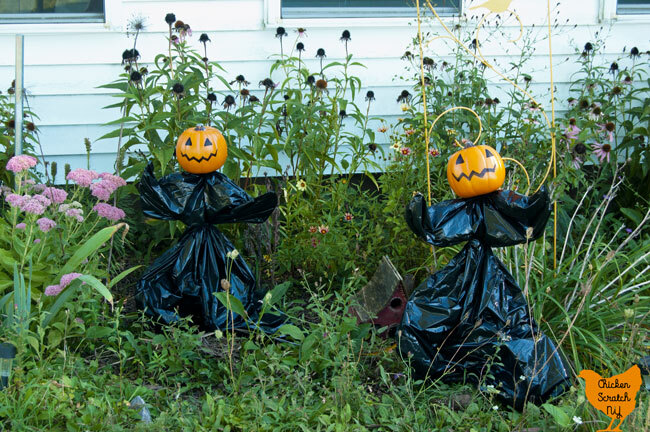 The bags I used were Lawn & Garden bags from the Dollar General, they’re a little but bigger than regular garbage bags. I turned the bags inside out so the side seams were smooth. You can cut the ties off the bottom if they bother you but I just tucked mine under. 1. Draw two triangles for eyes and a jagged line for the mouth. Fill in the eyes and the smile. 2. 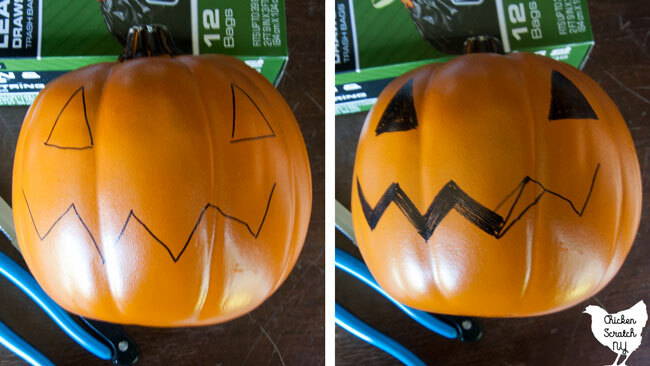 Flip the pumpkin over and cut a hole for the post. You can hold trace the post on the bottom for a close fit. You aren’t using anything other than friction to keep the heads on so don’t hack in a giant hole. 3. Cut a piece of wire a bit longer than the width of the garbage bag. 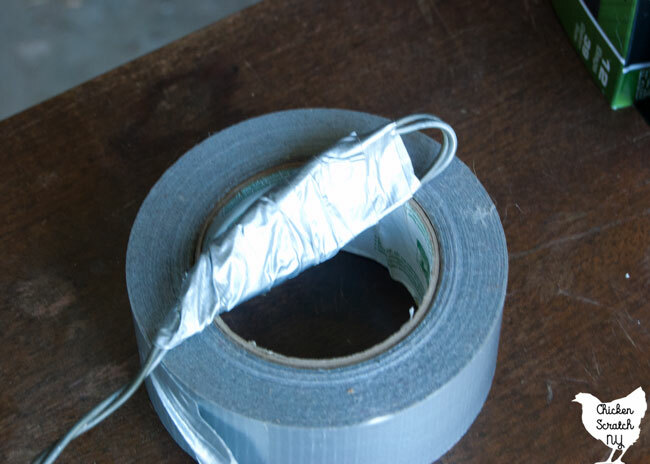 Bend the ends of the wire over a few inches and cover with the duct tape. It gives the ‘hands’ a little shape and keeps them from poking through the bag. 4. 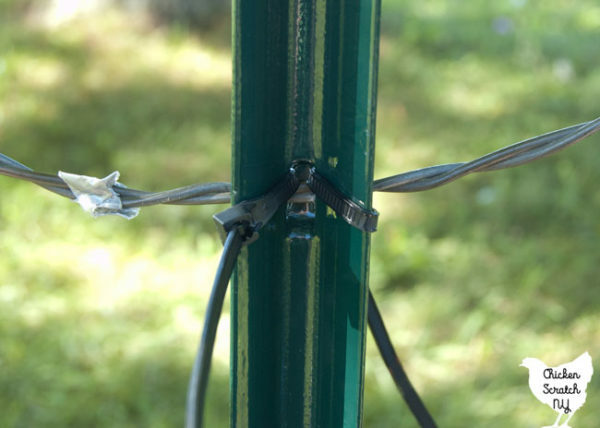 Secure the wire by running a few zip ties through the hole in the post. It might wiggle a bit. 5. Stick the post in the ground. 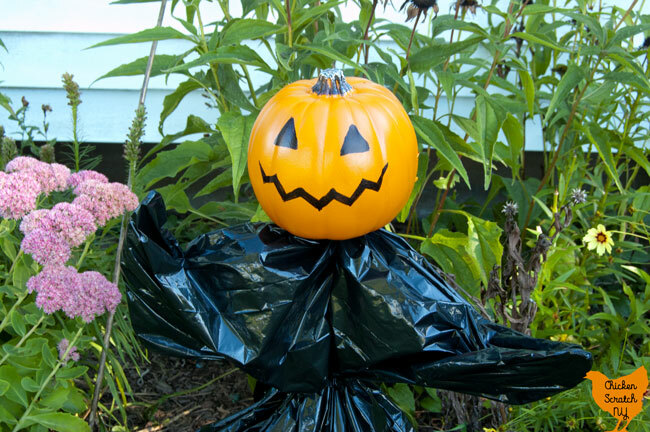 Flip the bag inside out and place it over the post so the hand loops are in the corners of the bag. 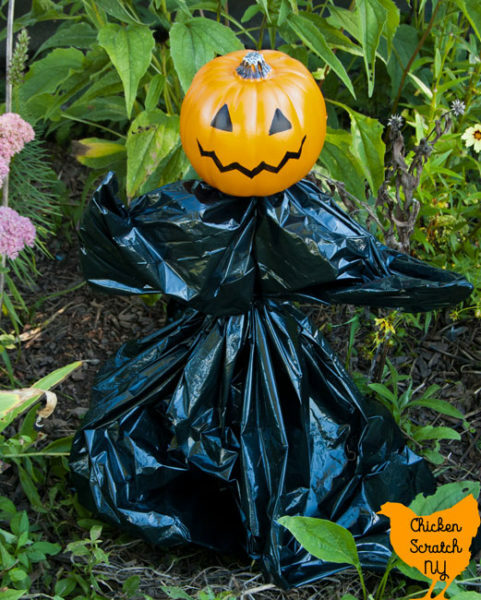 Once you get going it’s pretty easy to knock out a whole army of Halloween garden Pumpkin Goblins! I’ve got two out there and I’m already planning on adding a larger one and another baby. 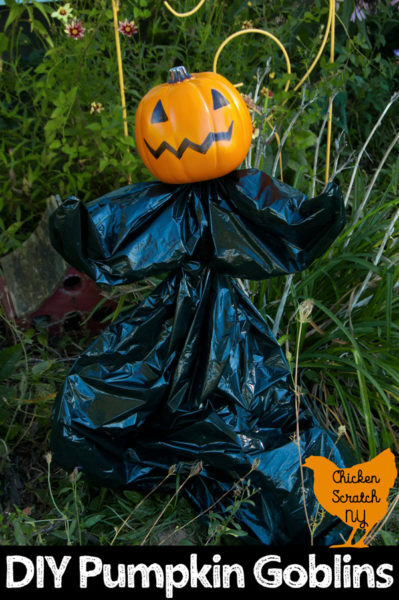 When it’s time to take down the decorations snip the zip tie around the waist, pull off the head, toss the bag and store the rest for next year. If you’re lucky you might even get to save the whole thing for next year. 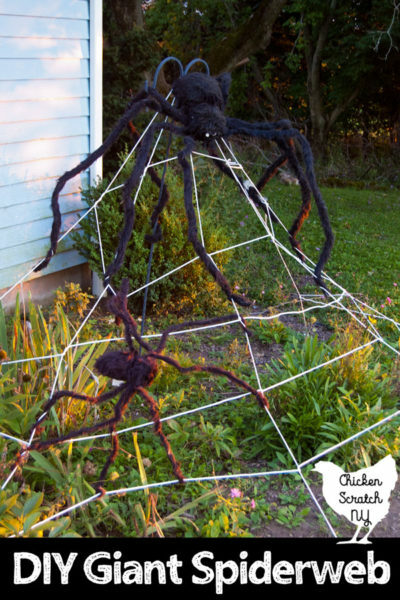 Don’t forget to PIN this to your Halloween Board!